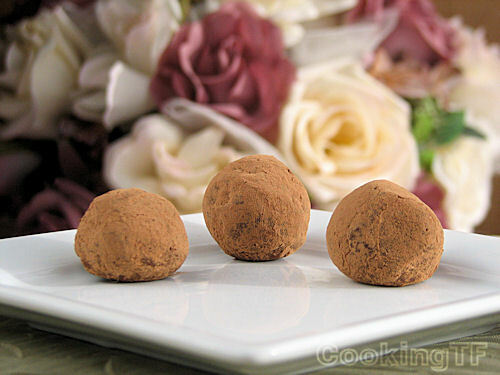 What better than truffles for a romantic holiday? These are startlingly easy to make with ingredients you likely already have on hand. It doesn’t have much hands-on time, it just requires some hands-off time to chillax in the fridge. According to Michael Ruhlman’s book, Ratio: The Simple Codes Behind the Craft of Everyday Cooking, truffles are just ganache made with your choice of flavorings, chilled in the fridge and then rolled in your choice of toppings. Ganache is made from equal measures of coconut milk solids or cream and chocolate. I don’t like a lot of sweet with my chocolate, so dark chocolate is perfect. If your family likes it sweeter, use a chocolate bar with a lower cacao content or add raw honey or another sweetener to the mix. Personally, even if you’d prefer to have them sweeter, I would recommend going with a dark chocolate and then adding your own choice of sweetener. Since even most dark bars contain white sugar, going as dark as you can find and then adding your own sweetener is a good bet to minimize your refined sweetener intake. In a small saucepan, combine the coconut milk solids and coconut oil and heat over medium heat until the mixture begins to wisp with steam. Remove from the heat and whisk in the chocolate. Allow to sit for a couple of minutes for the chocolate to soften,then whisk until the chocolate has completely melted. Whisk in the concentrace and salt. Add your optional flavorings and whisk thoroughly. Taste and adjust sweetness, if desired. Pour into a wide, shallow glass container and place into the freezer for two hours. Once your mixture is completely solid, scoop out small spoonfuls and roll briefly between your palms to round. Roll into raw cocao powder or cocoa powder that has been mixed with your preference of flavorings. Return to the fridge to harden. Mole truffles– Add 1/4 tsp cinnamon and a dash of chili powder or cayenne to the ganache mix and a dash of each to the raw cacao powder when you roll them out. Vanilla truffles– Add 1 tsp vanilla extract and a dash of ground vanilla beans to the ganache mix and a dash of ground vanilla beans to the raw cacao powder. Ginger truffles– Add 1 Tbs finely chopped, crystalized ginger to the coconut milk before you heat it and a light dash of ground, dry ginger to the raw cacao powder to roll. * To obtain coconut milk solids, place a can of full-fat coconut milk in the fridge overnight. Open the top of the can and the white, solid cream is what you want to use for this recipe. The thin, almost clear liquid can be used in other recipes, like hot chocolate or smoothies. This post is part of Make Your Own Monday, Your Recipe My Kitchen, Mangia Mondays, Melt In Your Mouth Monday, , Mouthwatering Monday, Fat Tuesday, Tempt My Tummy Tuesday, Tuesdays At the Table, Slightly Indulgent Tuesdays, Tuesday’s Tasty Tidbits, Show Me How Tuesday, Tip Me Tuesday, Meatless Mondays, Just Something I Whipped Up, Tasty Tuesday, Recipe Lion Dessert Blog Hop, Real Food Wednesday, Tuesday To Do, Real Food Wednesdays, Gluten Free Wednesdays, What’s Cooking Wednesdays, What’s Cooking Wednesdays, Weekly Recipe Swap, We Did It Wednesday, Show Off Your Stuff, Passionately Artistic, Cast Party, Your Whims Wednesday, Show and Tell, Show and Share. Who wouldn’t love these! So yummy. I’m sure they’d be a great gift. Yumm!! Easy and decadent, this one is right up my alley! I think I just found a use for the coconut milk thats in my fridge. Looks awesome! I’ve been looking at different truffle recipes. Thanks for sharing! Made these awesome little treats. Love them.